John Ralston Saul talks about Canada’s history and how Aboriginals helped to develop our country. 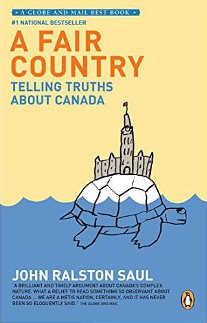 In this startlingly original vision of Canada, thinker John Ralston Saul unveils 3 founding myths. Saul argues that the famous “peace, order, and good government” that supposedly defines Canada is a distortion of the country’s true nature. Every single document before the BNA Act, he points out, used the phrase “peace, welfare, and good government,” demonstrating that the well-being of its citizenry was paramount. He also argues that Canada is a Métis nation, heavily influenced and shaped by aboriginal ideas: egalitarianism, a proper balance between individual and group, and a penchant for negotiation over violence are all aboriginal values that Canada absorbed. Another obstacle to progress, Saul argues, is that Canada has an increasingly ineffective elite, a colonial non-intellectual business elite that doesn’t believe in Canada. It is critical that we recognize these aspects of the country in order to rethink its future.